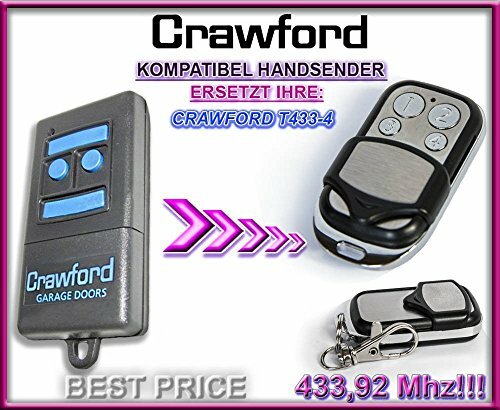 This is a high quality 433.92Mhz rolling code CRAWFORD compatible remote control replacement that can completely replace your CRAWFORD T433-4 , EA433 2KS, EA433 4KS, EA433 2KM(micro), RCU433-2, RCU433-4, N002800 remotes. ///Parameters:• 433.92Mhz rolling code frequency•battery and keychain included•High quality remote replacement!! ///HOW TO PROGRAM YOUR REMOTE: • program it like you would your original NORMSTAHL (CRAWFORD) remote. Standard programming using CRAWFORD receiver: 1)press programming button on your receiver, the LED will start to blink and receiver is in programming mode. 2) press button 1 on CRAWFORD replacement remote, the receiver's LED will start to blink rapidly. The remote is now programmed and ready to use. PROGRAMMING VIDEO: --> https://www.youtube.com/watchv=Ar7iSrTQkjU&feature=youtu.be ///We are fully committed for 100% customer satisfaction. IF YOU HAVE ANY QUESTIONS ABOUT YOUR PURCHASE PLEASE CONTACT US!